It was the summer of 1987 and despite some flirtation with teenage adolescence, we found ourselves on the weekends renting table space in large hotel conference rooms, selling small plaques of cardboard to mostly middle age men seeking to speculate on the prospects of the likes of Bo Jackson and Jose Canseco. No sales pitch required; all that was asked was plenty of product – i.e. baseball cards, and the capacity to keep a straight face while raising prices each week to seemingly absurd levels. If our parents didn’t know better or weren’t driving us, we were either selling drugs or worst. Our take – roughly a few hundred each weekend, went a long way for a 12 year old kid in the burbs, even at the glitzy Short Hills Mall. Although unbeknownst to our more youthful perceptions of the world, our little racket in North Jersey was less an anomaly and more indicative of the times. Conspicuous speculation, wealth and greed were all on daily display, manifesting later that year as life imitated art with the crash on Wall Street, just as we would be introduced to Hollywood’s Gordon Gekko. It was also the year of Donald Trump’s coming out party in the media as a brash, young and ambitious billionaire businessman, eager to leave his mark on the country he professed to understand better than anyone. 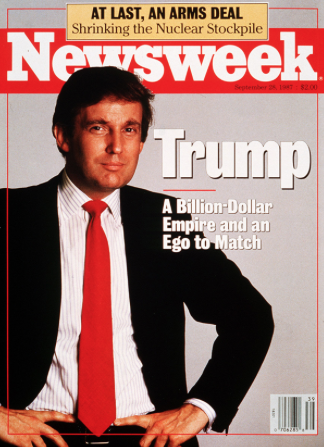 Some 30 years later, the writing on the wall and skyscrapers by the developer’s son from Queens, appears to have fulfilled his own ego’s expectations in 1987. And while he tripped and nearly crumbled in debt just a few years after his larger than life entrance, the P.T. Barnum of real estate and panache is having a monumental third act return. Whether he can deliver on his promises of “Making America Great Again” – is another debate entirely. 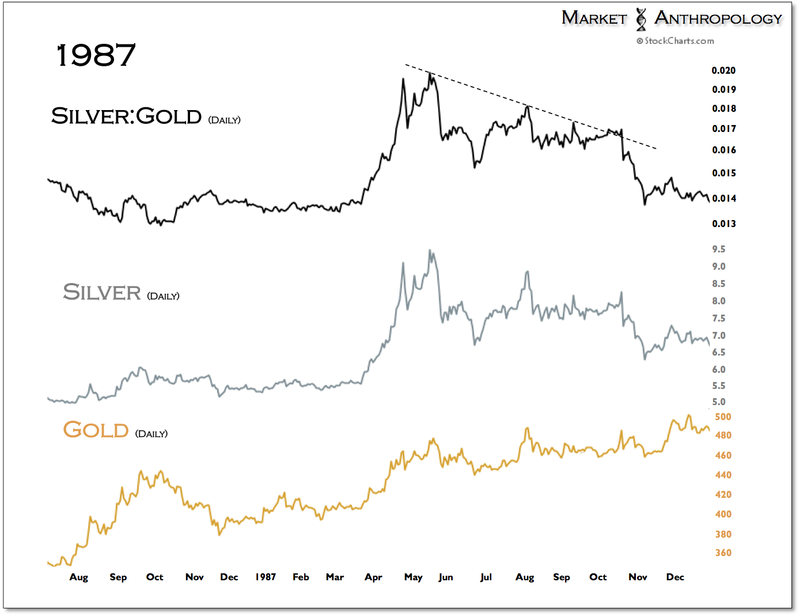 What’s not in question, however, are some of the touchstones in the markets from 1987 that have resonated with us over the past year, just not from the typical perspective that most analysts have viewed them against. Notwithstanding the current move in equities that through Monday had matched a January 1987 record in the Dow of 12 consecutive record high closes, we have looked at 1987 from time to time over the past year not exactly through the prism of equities, but mostly long-term Treasuries – which coming through last spring looked vulnerable to a breakdown similar to the one that took hold in the spring of 1987. 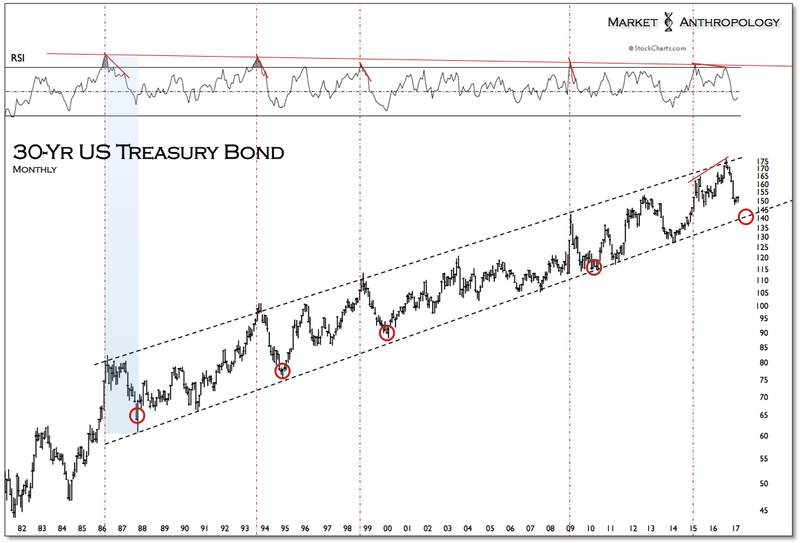 From an intermarket perspective – and in the wake of the major breakdown in Treasuries that manifested last summer akin to 87', we would argue that the move in equities is likely much more mature than the echo of the record January 1987 sounding that some have recently pointed to for more bullish intermediate bearings. 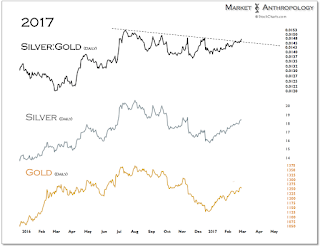 Their reasonings being, that although the markets may be near-term extended, like in January 1987, they still gained another 30 percent over the following 8 months. The old market adage applied – overbought can still become more overbought. That said, what the data mining ignores here is similar to the benevolent rotation out of bonds and into equities that supported the reflationary blowoff that began after Treasuries broke down in the Spring of 1987, stocks have been under this same strong reflationary momentum since last summer. In 1987, the initial breakdown leg in the 30-year Treasury bond registered a decline of ~14 percent. After remaining in a trading range for another 3 months, bond prices fell roughly another 10 percent, before finding a low as the equity markets broke down. Through the end of last year, the 30-year Treasury bond had fallen ~16 percent from its highs last summer. 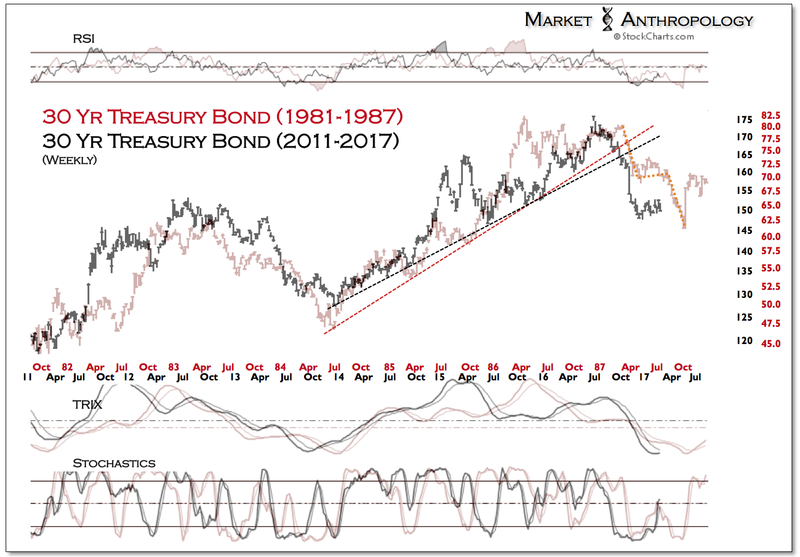 Although we still believe long-term Treasuries offer good relative value to investors as the limits of the US's mature economic expansion become increasingly visible this year, the more than 2 month trading range now appears susceptible to further near-term weakness, akin to the final leg lower in 1987. Moreover – and as we described last May in The Next Market To Break Might Not Be Stocks, a final leg could find support at the long-term trend line extending from the 1987 crash low. 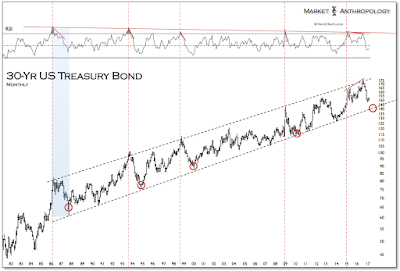 In the four previous occasions that the 30-year Treasury bond exhausted with a long-term RSI momentum extreme, it eventually found support at this rising trend line, which we guesstimate would come into play another 6 percent lower ~ 140. That said, tactically we do not feel the opportunity warrants taking another swing on the short-side of Treasuries here as the market is still listing with short positions and as we feel the economic data will again eventually disappoint. 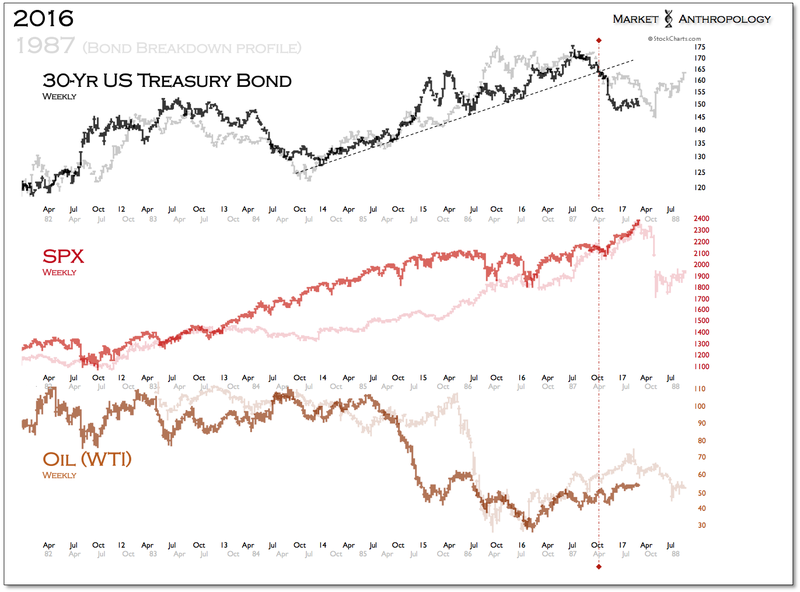 As such – and from a comparative risk/return perspective, the more compelling intermediate-term strategy is short US equities, not Treasuries. Similar to the broad reflationary move in 1987 that drafted oil higher with equities, extreme caution is warranted in oil as well, as we suspect the eventual pivot to be broad based. 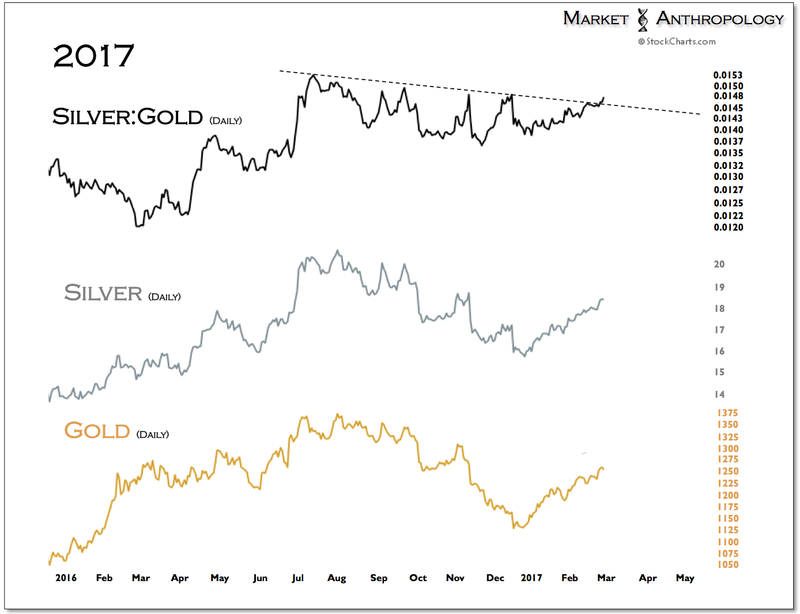 This also applies to precious metals higher beta assets like silver, which could disproportionally underperform in the turn. 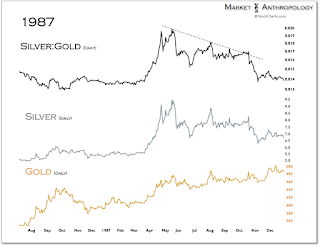 Although we had in our previous note looked for a breakout in the silver:gold ratio to accompany the next leg higher in precious metals, when contrasted with the set-up in 1987, the recent breakout may prove to be short lived. 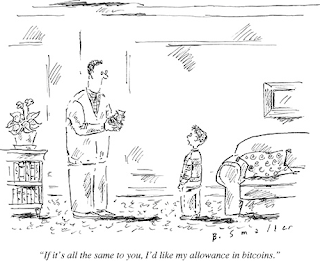 As a parting postscript, we thought we would also offer up our opinion to those chasing what we believe to be the speculative du jour of the day – bitcoin. Thirty years later and those same baseball cards are worth a fraction of what we had sold them for in 1987. For bitcoin investors, we fear the fall will be even greater – as in, worthless.